The Federal Reserve Bank of Boston, David Zhang, breaks down the survey of consumer payment choice and how rent is paid. The majority of payments are still non-electronic, but the trend in digital payments is increasing. Rental payments by consumers still remain in paper-check form, but this might be a bottleneck as older landlords are slower to adopt technology, but this looks to be changing fast. Compared to home mortgages rent is unique in that the median age of a renter is 25-36, whereas the median age of a homeowner with a mortgage is 65 and older. Tenants ages 25-44 make up 58% of renters, while 71% of landlords are 45 years and older. For transactions over $200 tenants are more likely to pay with an electronic option, except when it comes to rent. Some landlords set up a bank account for the tenant to make deposits as payments, which is about 8% of rent payments. Online bill pay makes up around 7%. 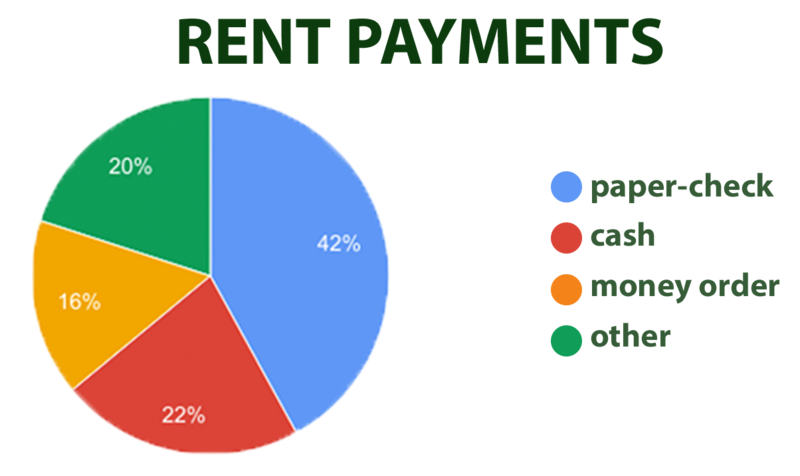 Renters are switching to a more digital form of payments for the vast majority of their transactions, but still pay rent in cash, check or money order. This could imply that older landlords are slower to adapt technology on behalf of tenants, but a large portion of homeowners themselves pay their mortgage via bill pay or direct withdraw into escrow. It could also be that tenants like having the float of three days before their account is drafted for the rent, but this wouldn’t explain cash or cashier’s checks. As tenants begin to age they are paying more of their transactions online and homeowner households are as well. Rent is the last frontier for paper checks, but landlords are starting to accept rent online. As technology improves for marketing and accepting applications for their rentals, landlords are finding new ways of completing their accounting and collecting rent. Tenants were asked about their top concern with online payments and security was at the top. As the use of payments via mobile apps and other online methods have increased, so has the security. Online payment platforms that put users in control of their information are becoming more accessible. Transactions do not pass sensitive financial information to recipients, removing significant information security risk, which paper checks do. In addition two-factor authentication is used, an optional feature that helps safeguard accounts at login. In addition, solutions like TenantCloud provide 128 bit encryption to protect access to such payments and limit payment options to selected landlords and rent only. Security has become so robust that sending paper checks are now providing far more personal information than any electronic payment. Cash provides no safe receipt for ensuring payment in the event of dispute and cashiers checks leave you with only a small coupon receipt to ensure payment. Digital payments now have numerous ways of being tracked, documented and limit that amount of information that gets passed along to recipients. As payment options become more available the cost of collecting rent online is lowering. TenantCloud offers TC Payments, which is a Dwolla ACH payment option of next day rent collection and no transaction fees. In reviewing TenantCloud data is was found that a high percentage of users allow online payments, but this is to be expected, given the user's obvious interest in cloud based accounting. The vast majority of landlords currently do not use an online payment solution. As more automatic accounting options come available in which allow landlords to collect rent online, landlords will commence using such options. As landlords embrace easier, more secure ways for collecting rent tenants too will most likely start using such options to pay the rent.